Meet author Susan Tan on November 15th at 6:30 p.m. at the Buder Branch, 4401 Hampton Ave.
Susan Tan’s novel, Cilla Lee-Jenkins: Future Author Extraordinaire has been chosen as St. Louis Public Library’s Fall 2018 Reading Pays – Pass It On! title. Meet Priscilla, “Cilla,” Lee-Jenkins! Soon to be a big sister, Cilla pushes hard to accomplish her goal of becoming a bestselling author soon, so her family won’t forget her. As many authors do, Cilla decides to write about her own life, but writing a memoir isn’t easy. Her book will cover many elements, including, what it was like to be bald until she was five, how she overcame her difficulties in learning to read, and the differences in the traditions of the two sides of her family, her Chinese side and her Caucasian side. It’s a tall list, but Cilla Lee is determined – if only she can make her deadline. Author Susan Tan has worked with children’s books since she was a young girl, when she was named “most likely to be a children’s book writer.” Cilla Lee-Jenkins is her first book, which is based on her own life. 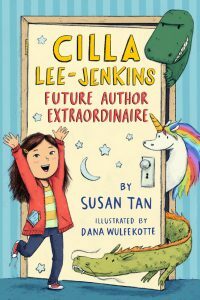 Kids in grades 3rd – 5th can get a free copy of Cilla Lee-Jenkins: Future Author Extraordinaire at any St. Louis Public Library location, while supplies last. Remember, Reading Pays – Pass It On! So read the book, share it with a friend, and come meet the author on November 15th! Also, be sure to check out the sequel, Cilla Lee-Jenkins: This Book is a Classic.